SharePoint Workflow Scheduler allows users to run any workflow automatically within a single SharePoint site collection on a specific date and time (according to a timetable). SharePoint Workflow Scheduler Web Part is a tool for Microsoft SharePoint 2019, 2016, 2013 and 2010 that allows users to run any SharePoint Workflow automatically within a single SharePoint site collection on a specific date and time (according to a timetable). SharePoint Workflow Scheduler is a no code and ready-to-use web part which can be installed on a SharePoint site and does not require Microsoft Visual Studio or SharePoint Designer to schedule SharePoint workflows. It is a part of Virto SharePoint Workflow Suite and Virto ONE License. SharePoint workflow scheduler allows you to unleash a time for more essential duties! Adjust a schedule for the SharePoint workflows to be run automatically on your SharePoint site and don't waste your time anymore. Adjusted schedule will work for the processes you need to run, and you can manage workflows from a single view. You can choose a special person on behalf of which the SharePoint workflows will be started. You can use this feature to allow to start workflows under project manager account or any other account when required. 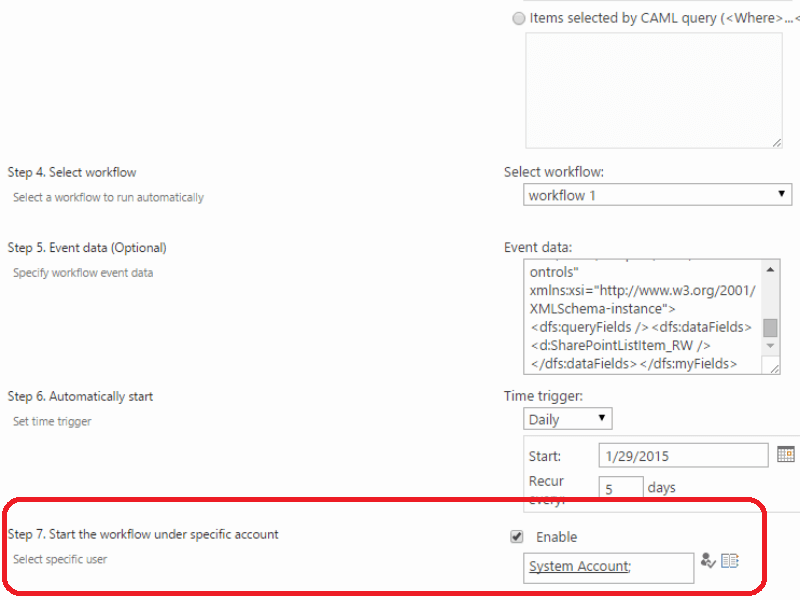 Use CAML-query to adjust SharePoint workflows running according to the required conditions (specify the object to be used for adjusted workflows). Just add required data in the settings block to adjust the schedule for an appropriate case. SharePoint Workflow Scheduler is a no code and ready-to-use web part, which can be installed on a SharePoint site and does not require Microsoft Visual Studio or SharePoint Designer. Once SharePoint Workflow Scheduler web part is installed, you can create specific rules on when to run the scheduled SharePoint Workflows, e.g., start every hour, day, or week, one time only, recurring, etc. 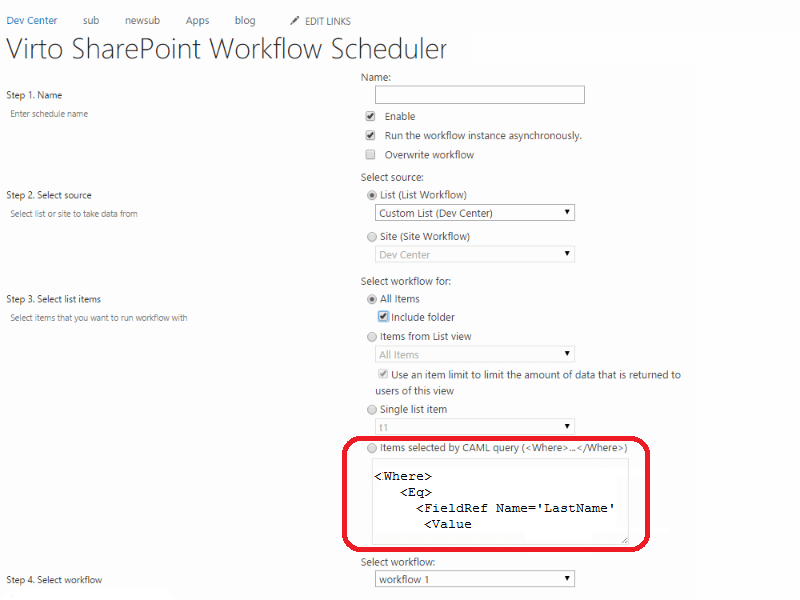 SharePoint Workflow Scheduler Web Part is compatible with SharePoint 2010, 2013 and 2016 versions. Start and run any SharePoint workflow according to a specific schedule You can easily create a hourly, daily, weekly, or any other schedule for the processes you need to run. Supported triggers Daily on a specific time, week, month, one time only, etc. Initiate workflow on any SharePoint List or Site within a site collection Any site or list can be selected for creating a Sharepoint workflow schedule. Start workflow for different objects Single list item, site, any list, specific list or view, list item selected by CAML-query. Recurring workflows For example, you can run a calculation of new clients attracted to the released product line buying every week. Workflow can be started under system account or any specific user account Define a user on behalf of which the workflow will be run. This Sharepoint workflow scheduler helps to save a lot of time by automating workflow process. I'll continue to use this tool. This is the best SharePoint scheduling app for me! This workflow scheduler is no-code and really feature-rich so you can automate all your workflow processes to run it more effectively. The more I look at this, the more impressed I am. 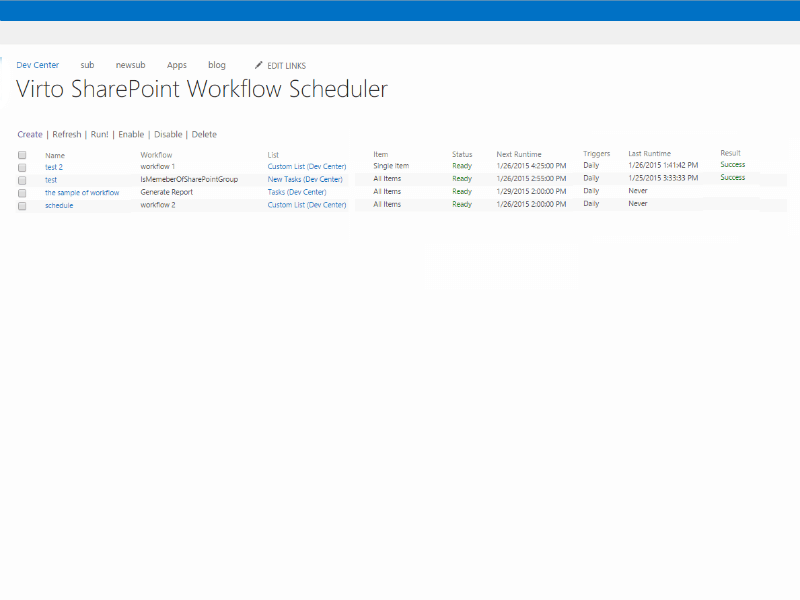 This SharePoint workflow scheduler is a perfect workflow management solution. Saves a boatload of time. I use this tool to automatically re-size pictures uploaded to a SharePoint list daily. Definitely eliminates redundant tasks and gives me more time to do other tasks! It offers a lot of functionality to enhance SharePoint's capabilities. I've rarely found a product that represents such excellent value for money. Great time saver, simple to configure, free trial.